The handheld GT-4500 is 1/3 the cost of Versthon's BVI 6400 handheld AND you don't have to spend thousands per year on calibration. This handheld bladder scanner produces accurate assessments and saves you yearly in calibration costs! CardiacDirect is pleased to announce the brand new release of the CardioTech GT-4500 and the CardioTech GT-5500 bladder scanners. Both bladder scanners require no calibration due to their patented core technology. CardioTech bladder scanners are powered by Caresono imaging utilizing Caresono’s world-wide patented probe technology. This new highly accurate stepper motor and speed reducer mechanism reduces wear and tear and requires virtually no calibration. The CardioTech bladder scanner series proudly distinguishes itself with digital components, whereas competitive products like Verathon use mechanical gears and require yearly calibration at a cost to the clinician. CardiacDirect is proud to offer the CardioTech bladder scanners, as they provide value and cost savings to the clinician which is at the core of CardiacDirect’s mission statement: bringing value to the marketplace. For example, the handheld GT-4500 is 1/3 the cost of Versthon's BVI 6400 handheld AND you don't have to spend thousands per year on calibration. CardiacDirect provides the largest selection of quality cardiology equipment at the lowest price anywhere direct to your location. At Cardiac Direct, it's not just about product selection, friendly customer service, fast delivery and everyday low prices. CardiacDirect is a company dedicated to helping you find the right medical product to fit your needs and help improve the quality of the care you give. CardioTech™ is the leading manufacturer and marketer of non-invasive patient monitor products including EKG, ECG, Ultrasound, Holter, Vital Signs, Co2, Blood Pressure, Fetal and Pulmonary Monitoring. Caresono Technology CO., LTD is located in China’s largest border city—Dandong. 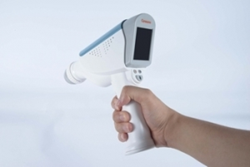 Caresono, a high-tech enterprise, is mainly engaged in R&D, production and promotion of medical ultrasonic instruments and related equipment. CardioTech GT 4500 Product CatalogThe Product Catalog for our CardioTech GT 4500 portable bladder scanner.